I’m a bit of a nutter when it comes to coaching kids. I think it’s very easy for parents/coaches/adults to over-coach and ultimately make golf harder than it needs to be. This happened to me and I suppose I have a chip on my shoulder about it. Here’s an example of a simpler and better way to coach. Scotty is my mechanic, and his son Christian as an interest in golf. Scotty works from home and after he gave me a rundown on all the issues with my car (I’m hopeless with mechanical things and rarely look after them properly) I suggested to Christian we hit some golf balls into their bottom paddock. He didn’t need to be asked twice. He ran and got his clubs and a pocket full of golf balls. Christian, like me, is left handed and I told him that all the best players are lefties and it wouldn’t be long before he was beating his dad. He smiled and was ready for some coaching. Christian stepped up to the first ball and it went out to the left. Scotty: He always hits it to the left. What’s he doing wrong? Me: Nothing. It’s his first hit. Give him some time to get comfortable and relaxed. Christian went again and this time he whacked the ground before the ball and took a huge divot. Scotty: Yeah, If I need any holes dug I’ll get Christian to swing his club. I then got the young bloke to refocus, asking him to brush the top of the grass with the bottom of his club. He made some perfect practice attempts and then I tempted him with another ball. This time the contact was ideal. The ball flew higher into the air and with good distance. I remained calm and hid my enthusiasm. Me: Have another go. Hit that ball with that club. Repeat. It was another great attempt, this time the ball going a little bit more left than the previous. Scotty: Why does he hit the ball to the left? Me: Why do you think it does? Scotty: Is it something to do with his grip? Scotty: Is it his swing? Scotty: It must be his wrists then, isn’t it? Me: No. It’s none of these things. Christian, would you like to hit the ball straight down the paddock towards the dam? Christian: Yes, that would be good. Me: Ok then. I now what you to keep your focus on hitting the grass with the bottom of the club, but this time I want you to feel like you’re aiming your body more to the right. Christian: How far should I aim? Me: That is up to you. How about you try one and let’s see how that goes …. He readjusted his stance – you could see his mind ticking over – and then took a moment to get comfortable, then swung. The ball too off at the dam with a much higher and stronger ball flight. Scotty: Great shot mate! That was so simple!!! You didn’t tell him anything, he worked it out all by himself. Me: Yep. This is natural learning. I like to think of this as proper learning. And kids, because they are less likely to over-think what they’re being coached, are much more responsive and get really good results. If he can practice this way for the next few months, he’ll develop a natural and powerful swing that will enable him to be a really good golfer. Scotty: What about the Swing Trainer device you gave me, will that work for him too? Me: Sure will. Let’s give that a go. I laid the mat on the concrete driveway and asked Christian to make some swings with the focus of brushing the mat with the bottom of his club. His first few attempts went over the mat, no contact was made. Success. He hit the mat and received feedback through feeling and the sound the swing made. Me: Great job mate. Your mission is to practice for a few minutes on the mat, making sure you hit the mat with the bottom of your 7 iron. When you’ve done that for a bit, jump off the mat and hit some balls, making sure you take some divots on your dad’s nice lawn. 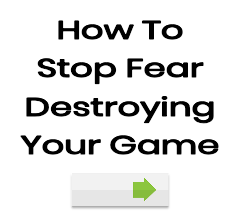 When all this gets too easy for you, ramp it up a little by swinging with your eyes closed. I honestly don’t think Christian could have got a better first lesson. 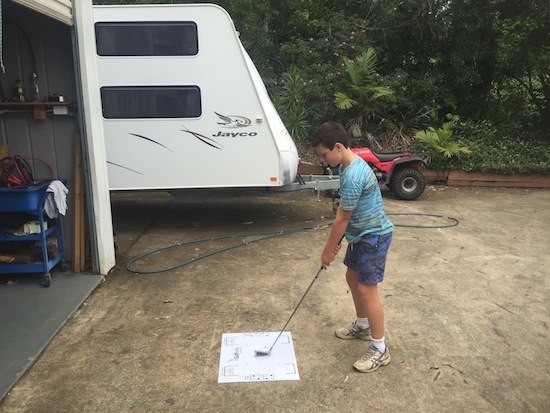 It would have been easy to change his grip and try and impress his dad with all sorts of golf science crap – but none of this would have helped. Coaching isn’t about filling up and over-loading. Coaching isn’t about HOW much the coach knows. It’s about learning, exploring and having fun. Sometimes the coach needs to stand back and let our amazing learning system take hold. Christian learning golf. Here, he is hitting the bottom of the club into the mat. P.S. I ran into Scotty the other night and he tells me the young guy has been swinging and hitting balls. I think a coach’s job is mainly to challenge and push the students ability a little, making them better. It’s uncomfortable to go beyond your current abilities yes, but making mistakes is how you learn. Coaching should be a nudge forward.